DES fails in the all important STEMI – EXAMINATION ! DES is a revolutionary coronary support device , but it was always a suspect when it came to STEMI and primary PCI . How good and safe is DES in STEMI ? Cardiologist were always beating around the bush for a specific answer to this question. DES was thought to be unsafe in a thrombotic milieu . (DES was notorious for acute stent thrombosis) .Still ,first generation DES ( Sirolimus and Paclitaxel ) were thought to be unsafe in STEMI .However anecdotal evidence suggested DES reduced stent thrombosis . .Then came the 2nd generation DES (Zotarolimus and Everolimus ) . There was a excitement every where .The logic was “If first generation of DES is not good . 2nd generation must be good” What a way to think scientifically .Wisdom did not prevail . Many started using ZOTA /EVERO in STEMI . (Medtronic and Abbot were silently enjoying the scenario !) And now finally Everolimus was tested with BMS in STEMI . It has found 2nd Generation DES are not superior to BMS in STEMI in terms of patient outcome . The study broadly concluded that the patient related parameter did not show any significant difference while stent related outcome seemed fare better. Why this patient – stent dissociation ? Does this mean these stent thrombosis are safe events ? The answer lies in the fundamentals. The stents represent anatomical correction , while the patient outcome depend more on physiology ( flow ) so we are back to square one to the fundamental coronary conflict ie improving anatomy need not impact physiology. After reading the EXAMINATION trial I asked my third year fellow . What was the re-stenosis rate in DES vs BMS at 6 months ? He said this study never analysed the issue of re-stenosis . I asked him , Are you sure ? What a way to conduct a large land mark study ? This study never bothered to find out the re-stenosis rate with DES after primary PCI and compare it with BMS . 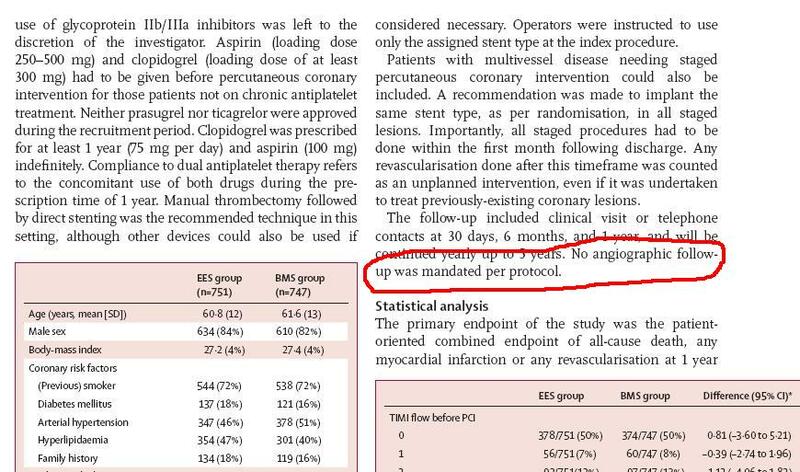 In fact they have conveniently mentioned , follow up angiogram was not part of the study protocol . I concluded at the end of journal review meet , that this EXAMINATION was not properly conducted and DES may come back with a vengeance in the near future !